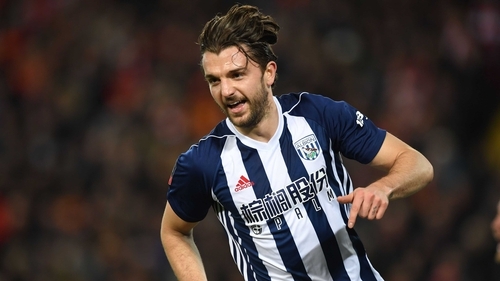 West Brom have rejected a £16million offer from Burnley for Jay Rodriguez. The bid falls well short of the Baggies' valuation of the striker and is believed to have been instantly dismissed. Albion want to keep hold of the England international, who is not agitating for a move, as they plot an instant return to the Premier League. Burnley have already had a joint £25million bid dismissed for Rodriguez and Craig Dawson with Albion valuing the pair at least £20million each. The Clarets must now weigh up whether return a third time as boss Sean Dyche chases reinforcements at Turf Moor. Rodriguez initially left Burnley for Southampton in 2012 in a deal worth around £7m and joined Albion last summer for £12m. He scored 11 goals in all competitions but could not keep the Baggies in the Premier League. Bournemouth were also interested in the striker but their interest appears to have cooled having tied down Callum Wilson to a new contract. West Brom, who host Bolton in the Sky Bet Championship opener on Saturday, have already lost Jonny Evans and Ben Foster following their relegation. Nacer Chadli, Salomon Rondon and Dawson could all go before the transfer window closes next Thursday. Burnley finished seventh in the Premier League last season and Dyche is keen to bolster his squad as they plan for a Europa League campaign. They face Aberdeen in the second qualifying round of the competition on Thursday having drawn the first leg 1-1. Newcastle United have signed Japan forward Yoshinori Muto from Mainz on a four-year contract for a fee of around £9.5m. Newcastle said last week that they had reached an agreement with the Bundesliga club for the transfer. Muto's move was completed on Thursday after he was granted a work permit. "I'm honoured to be a player for such a big club," Muto, the first Japanese player to join Newcastle, said. "I hope to achieve good results, that's what I'm here to do. I would like to perform well and leave my name in Newcastle's history. Muto, 26, is Newcastle's fourth permanent signing of the close season following goalkeeper Martin Dubravka, midfielder Ki Sung-yueng and defender Fabian Schar. Newcastle begin their league campaign by hosting Tottenham Hotspur at St James' Park on 11 August. Brendan Rodgers could offer no clarity that Celtic will have any new signings before their next Champions League tie but the Hoops boss is happy to remain patient in the transfer market. Celtic came through the second qualifying round against Rosenborg with a 3-1 aggregate win despite being without defenders Jozo Simunovic, Dedryck Boyata and Mikael Lustig and injured forwards Moussa Dembele and Leigh Griffiths, some of whom will be back to face AEK Athens next week. Rodgers, whose only summer signing, Odsonne Edouard, was at the club on loan last season, said: "There is some work going on behind the scenes but there is nothing to give any clarity on anyone coming in. "I think every manager and coach will always look and think they always need more. I want it for the supporters, I want it for the squad, but I want quality. We could have had lots of players in but we only want quality." Fulham have made another big-money move by signing Alfie Mawson from Swansea. The centre-half has moved to Craven Cottage on a four-year deal for an undisclosed fee, after impressive showings in spite of Swansea's relegation. Argentina striker Gonzalo Higuain is undergoing a medical at AC Milan ahead of a reported season-long loan from Juventus. The 30-year-old moved to Juve from Napoli in 2016 for a fee in the region of 90million euros (#80m) and scored 40 goals in 73 Serie A appearances for the Turin club. However, the €112m signing of Cristiano Ronaldo from Real Madrid earlier in July pushed Higuain down the pecking order at the Allianz Stadium. Italian media suggest Milan will pay an initial €18m to loan Higuain with the option to make the move permanent for €36m at the end of the season. Milan posted pictures of the forward, who was wearing a Rossoneri jersey, on their official Twitter account on Thursday morning prior to his medical. As part of the deal, Italy defender Leonardo Bonucci will reportedly return to Juve from Milan just a year after he left, with Mattia Caldara moving in the opposite direction. Juventus posted a picture of the 31-year-old Bonucci on social media before he underwent his medical, while Milan tweeted images of centre-back Caldara arriving to complete his move. Portugal youth international striker Xande Silva has become West Ham's latest summer signing. Silva will start out with West Ham's under-23s and may have to wait to feature in Manuel Pellegrini's first team. Doucoure has developed into one of the best midfielders in the Premier League with his pace and power and attracted interest from some of the best clubs in the division. "I am delighted that Abdoulaye has shown his commitment to what we are trying to achieve by signing a new long-term contract with Watford Football Club," chairman and chief executive Scott Duxbury told the club's official website. "It has become perfectly clear that our ambitions as a club match Abdoulaye's ambitions as a player, and we are looking forward to continuing to work together to reach our goals."